I won NHMA.com on NameJet in August of last year, and the domain name was provisioned to my Network Solutions account. In December of 2018, I transferred NHMA.com to my GoDaddy account, where I consolidate many of my domain names. 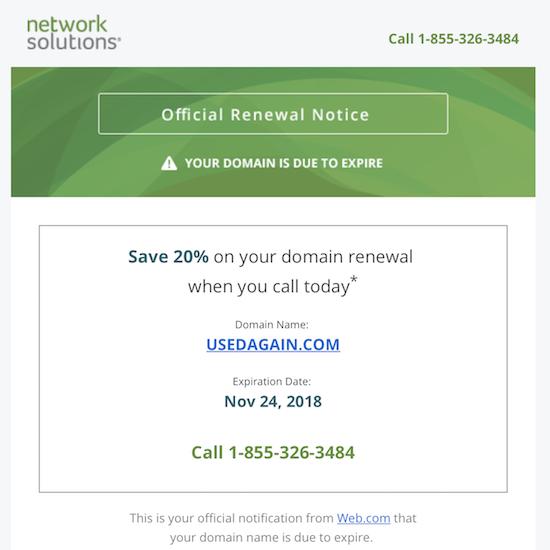 Since transferring the domain name in December, I have received a variety of email notifications from Network Solutions all trying to get me to renew NHMA.com. I have received emails with subjects like “Deactivation Notice,” “Renew Early and Save,” and “Final Renewal Notice.” Each email has different language and graphics, but ultimately, they all want me to renew this domain name and others. I counted 15 of these emails since the beginning of 2019. The Gab.com domain name is on the move again. The domain name transferred to Epik earlier today after being registered at Uniregistry for a very brief period of time. This comes on the heels of GoDaddy’s ultimatum that the domain name be transferred away from GoDaddy or face suspension. Andrew Allemann reported that Gab.com is registered to Escrow.com’s holding account after selling on Flippa for $220,000 in September. Andrew speculated that this could mean the domain name was purchased using some sort of payment plan. Escrow.com does not comment about private transactions though, so the ownership information as it relates to the Gab.com domain name is a bit unclear. There is quite a long thread on NamePros about Gab and the issues involving the Gab.com domain name. In a series of posts within the thread, Epik CEO Rob Monster seemingly invited Gab to transfer Gab.com to Epik and offered his thoughts on the topic. I reached out to Rob to ask him why and he did this and whether he got in touch with Andrew Torba, the founder of Gab. The only problem with this email is that the domain name was transferred to GoDaddy back in March. A Whois search confirms that the domain name is no longer registered at Network Solutions. It would appear that the UsedAgain.com record in my Network Solutions account is known as a “ghost record.” This means that it would appear to exist within my Network Solutions account, but it is really at GoDaddy. I would not be able to modify nameservers, set up forwarding, or do anything else with the domain name from within Network Solutions. GDPR went into effect last week. Even though GDPR is a European Union data protection and privacy regulation that does not cover Americans or other people who are not EU citizens, some domain registrars totally eliminated public Whois lookup information to ensure they do not violate GDPR regulations and potentially expose themselves to serious penalties. I have found that some domain name registrars have not eliminated public Whois lookups and Whois information, and I want to share what I found with you. This is certainly not an exhaustive list of registrars, and as far as I can tell, Whois information is only publicly available for registrants who do not have a European presence. I used a combination of registrar Whois searches, ICANN whois searches, and DomainTools Whois searches to see which registrars are blocking information and which are still showing information. I invite you to share the name of registrars that are not using something like “Data Protected” for Whois lookups as you find them. “In many cases, domain name registrars will not be able to get the registrant email address from Whois that is necessary to send a Form of Authorization when someone transfers a domain name to them. As a result, gaining registrars will be allowed to skip the Form of Authorization requirement.” (emphasis added by me). From what I understand, domain registrars are responsible for generating EPP authorization codes. Each registrar may have its own process for creating them and for updating them regularly or periodically. With the new transfer process coming into play, I think it is very important for domain registrars to reset all EPP authorization codes. If that would be a major inconvenience for customers who are in the middle of a domain transfer, perhaps the EPP codes could be reset for those that were requested more than 30 days ago.